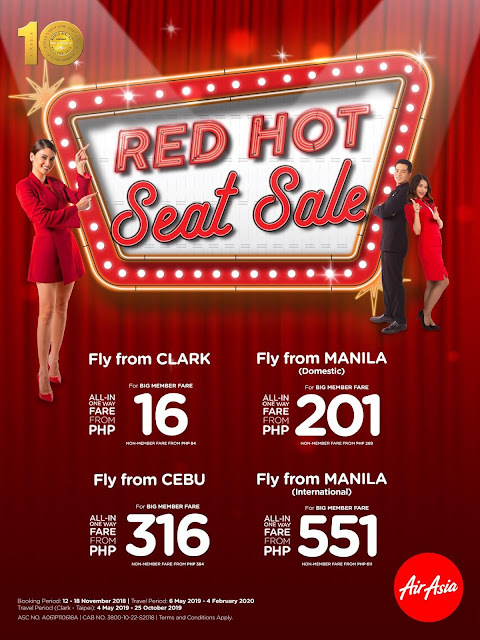 The Food Alphabet and More: AirAsia Red Hot Seat Sale is back! *Promo seats are for BIG Members only. Seats are limited and may not be available on all flights, all destinations, public holidays, school breaks and weekends. Seats exclude airport fees and other fees. A payment processing fee is applicable to all payments made using direct debit, credit, debit or charge cards. Our other terms and conditions of carriage apply. All - in fares including taxes and fees. Terms and conditions apply. AirAsia Philippines (AAP) is a wholly owned subsidiary of AirAsia Philippines Inc, a joint venture between Filipino investors Antonio O. Cojuangco, former Ambassador Alfredo M. Yao, Michael L. Romero, Marianne B. Hontiveros, and Malaysia’s AirAsia Group Berhad. The airline started its commercial operations in 2012 in Clark, Pampanga and has since expanded to include hubs in Manila, Cebu, Clark and Kalibo. AirAsia currently operates a fleet of 21 aircraft with several flights to and from Manila, Cebu, Clark, Davao, Tacloban, Puerto Princesa, Iloilo, Tagbilaran (Bohol), Kalibo, Caticlan and Cagayan de Oro in the Philippines with international flights from Manila, Cebu, Davao, Clark and Kalibo to Kuala Lumpur, Kota Kinabalu, Hong Kong, Macao, Shanghai, Shenzhen, Guangzhou, Ho Chi Minh, Bali, Taipei, Kaohsiung, Singapore, Seoul/Incheon, Pusan and Bangkok. AirAsia, the leading and largest low-cost carrier in Asia by passengers, services an extensive network of over 130 destinations. Since starting operations in 2001, AirAsia has carried more than 500 million guests and has grown its fleet from just two aircraft to over 200. The airline is proud to be a truly Asean (Association of Southeast Asian Nations) airline with operations based in Malaysia, Indonesia, Thailand and the Philippines as well as India and Japan, servicing a network stretching across Asia, Australia and New Zealand and the Middle East. AirAsia has been named the World’s Best Low-Cost Airline at the annual Skytrax World Airline Awards ten times in a row from 2009 to 2018. AirAsia was also awarded World's Leading Low-Cost Airline for the fifth consecutive year at the 2017 World Travel Awards, where it also beat a field of full-service carriers to become the first ever low-cost carrier to win World's Leading Inflight Service.